This great ride begins when Tahoe Elite drops your crew and your bikes off at Spooner Lake day use area in Lake Tahoe Nevada State Park on the east side of Lake Tahoe. We will point out the signs leading you to the Flume Trail—via North Canyon Road—and off you go. This road runs past the old shepherd’s hut, then gives way to rolling uphill terrain through beautiful Aspen groves that thrive in the Carson Range on the east side of Lake Tahoe. The half-mile of climbing past Snow Valley is where you become friendly with that shiny little granny gear on your mountain bike. You start the ride at 7000′ and climb to 8157′, giving you 1100′ to climb, so take your time and savor these ascents as they are the only ones you’ll do all day. At the summit, a quick break under the whispering lodge pole pines quickly dries the sweat and refreshes the soul. Next, a short descent leads to the peaceful, pristine Marlette Lake. Cool off by taking a dip in the lake! In the fall, the colors at Marlette Lake are a sight to behold. A mile and a half of riding on the dirt road along the shore of this beautiful lake leads to the incredible Flume Trail. The Flume Trail is nearly flat, dropping only 40′ per mile, and is spectacular in its setting. 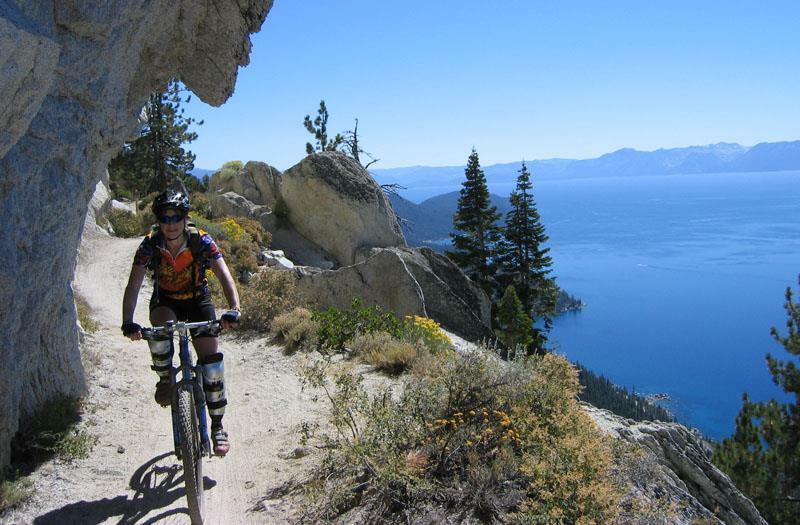 1600′ above the east shore of Lake Tahoe, and only a half-mile away from the shoreline in places, it is truly one of the premier trails in the world. Stop often and enjoy the view. Take something to eat and drink for an unforgettable picnic. At the end of the Flume Trail, there is a 3 mile, 1500′ descent down to Highway 28. The Flume Trail is a moderately difficult ride at 7000′ to 8000′ feet in elevation with over a 1000′ of climbing and 4.5 miles of single track. The Flume Trail, itself, traverses above several steep sections, so those afraid of heights be forewarned. Tahoe Elite will pick you up in the parking lot of the Tunnel Creek Cafe, a great little spot to grab a post-ride sandwich and a chilled beer. This 9 mile loop is a moderate trail with some challenging sections and an elevation gain of 500 feet. The Sawtooth Ridge Trail, which happens to be right around the corner from The Cedar House Sport Hotel, offers up a rolling, winding single-track haven for intermediate riders—in addition to some spectacular views of the Truckee River Canyon. The main trail is a 9-mile loop which is best ridden counterclockwise due to extensive scree (broken rock fragments), which makes ascending (clockwise) much more difficult. The main trail also connects with many fire roads and the Mt. Watson trail network along the way. In fact, the more ambitious rider can ride all the way to Tahoe City (and back) starting at this trailhead. The area has seen an explosion in new trails in the past couple of years and with good reason. Enter an intermediate rider’s dream, with dozens of miles in this network of trails that span from Truckee to Tahoe City. From the trailhead, follow the single-track to a vista point offering views of the Truckee River, Squaw, and Highway 89. Continue on the trail to Sawtooth Ridge Road, cross the road to continue on the trail before reaching a sign that says 2 Beavers & a Bear and Two Bridges. Make a nice loop by starting toward 2 Beavers & a Bear and finishing on the Two Bridges trail (there’s actually 3 bridges).